Welcome to our sunroom design ideas. While there are technical differences between a conservatory and sunroom, the terms are often used interchangeably. Surrounded by glass windows and ceiling, this sunroom lighted by a glamorous chandelier boasts a stunning view of the nature surrounding the area. A nature-friendly sunroom featuring a 6-seat dining table set lighted by a chandelier. Balcony-type sunroom with white walls and hardwood flooring. The French doors lead to the home’s indoors while the glass windows overlook the beautiful surroundings. The nice seats of this sunroom look very attractive. The hardwood flooring looks perfect together with the walls. Bricked walls, sleek pieces of furniture and neutral colors sum up this farmhouse-style room. A sunroom located outside the actual house. This blue-colored room has a fresh garden finish. A transitional sunroom with a high ceiling, wooden furniture and dirty white walls. Large all-glass sunroom with sofa and other lounge furniture set. A sunroom featuring an elegant sofa set with a glass top table matching the seats. Indoor plants surround the lounging space. Medium-sized room in a country-style aesthetics. The hardwood floor is carpeted for that beautiful and elegant finish. The enchanting vine leaves clouding over the ceiling of the sunroom and blocking the direct sunlight give cooler vibe to the room. Large sunroom featuring dark tiles flooring with a large fireplace and a high ceiling with ceiling fans equipped with lighting. Sunroom with black and white furniture, and a minimal touch of modernity. Tropical sunroom looking elegant with its aesthetical arrangement. Country-style sunroom with hardwood floor and a floral couch. An eclectic sunroom with a garden view. The walls are made up of bricks and the floor is covered with a creative, striped carpet. A country-style sunroom with tiled floor, glass windows and some potted plants. A fresh and elegant-looking living room with several glass windows, potted plants and printed throw pillows to match with the atmosphere. A tiled sunroom with a decorative rug, traditional chairs and a glass top table. A contemporary sunroom with hardwood floor, glass windows and glass ceilings. 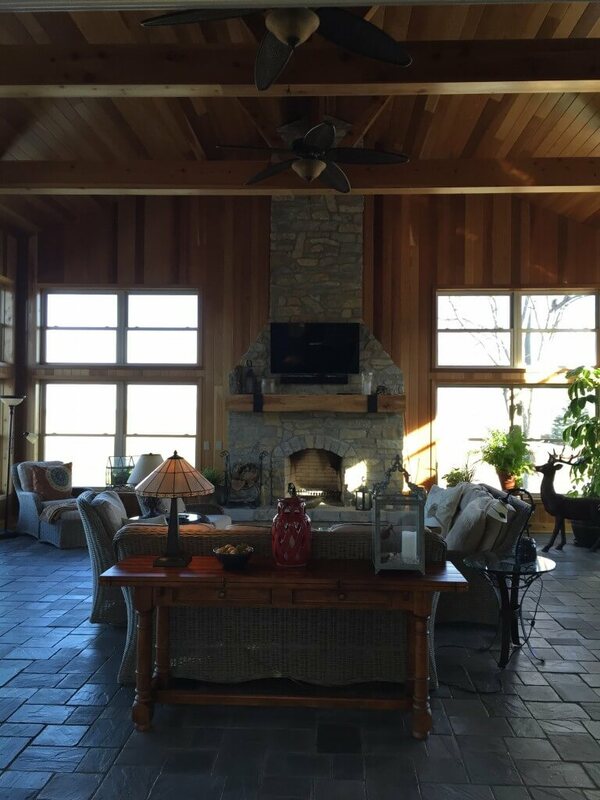 A country-style, tiled sunroom dominated with warm tone of cherry-finished door, windor frames and counters. A tropical type of sunroom incorporated with some detailed chairs, bricked walls, tiled floor and of course, some potted tropical plants. This small-sized room is simple but indeed aesthetical. Its carpeted floor matches well with the wall’s color. A contemporary type of sunroom located near the garden for that fresh environment. Modish and large sunroom with a nice set of seats and a dining nook set on the classy tiles flooring. A glass-dominated glass sunroom with an elegant black dining nook set on top of the classy hardwood flooring. A covered sunroom featuring small brick tiles flooring with lots of indoor potted plants adding colors to the space. A patio-type sunroom with comfy seats and glass windows overlooking the lovely garden area. The seats of this sunroom looks elegant. It matches the black carpet flooring as well. A large sunroom with classy seats under the charming wooden ceiling with a ceiling fan and lighting combo. The dark rattan seats with cushion seats make this sunroom a great lounging space while overlooking the beautiful garden. A modish sunroom with a nice set of sofa and a fireplace along with the TV on top. The glass shelves add style to the room as well. A huge sunroom featuring cherry-finished hardwood flooring and tall glass doors and walls overlooking the nice outdoor views. Classy sunroom featuring a stylish fireplace and a sofa set in front. A nicely set up seats in the sunroom surrounded by beautiful greeneries outside. Large sunroom featuring a sofa set and a dining nook under the vaulted ceiling. A very charming sunroom made of hardwood and glass. The seats look very attractive as well. This sunroom near the beach offers a magnificent ocean view while lounging on the cozy seats set on the hardwood flooring. A white sunroom featuring a dining table set along with French windows and doors surrounding the area. A large sunroom with stylish built and classy seats along with lovely indoor potted plants surrounding the area. A cozy sunroom with modish seats on top of the hardwood flooring. The glass windows look very stylish as well, perfect with the room’s modern style. A lovely sunroom featuring a hammock near the corner of the room. The glass windows let you overlook the relaxing view surrounding the space. A massive sunroom with a stylish carpet flooring and cozy sofa set. The white walls and ceiling looks perfect together with the dark shade. A perfectly placed and equipped sunroom with lovely curtains and modish glass doors and windows. A white sunroom with cherry accent. The indoor potted plants add colors to the relaxing room. This sunroom is surrounded by white walls and ceiling along with light-finished hardwood floors. The glass windows overlook the stunning ocean view. A large sunroom with white walls and ceiling along with the tiles flooring that matches the finishing of the cabinetry. A large sunroom featuring brick walls and tall ceiling along with the classy carpet flooring and stylish seats and table set. This large sunroom boasts modish seats set on the hardwood flooring. The indoor plants look so charming. The greeneries outside offers a nice relaxing view. An elegant sunroom with beautiful glass windows, white walls and ceiling and hardwood flooring covered by a rug. Conservatories, in the strict sense, are historically used for horticulture while sunrooms are living rooms built as an extension to the home and have plenty of glass. Technically a conservatory has a glass, transparent ceiling while this is not necessary for a room to be a sunroom. However, these days the two terms are used interchangeably; sunroom being the more common term in the USA and conservatory used in the UK. Below you can see many examples of sunrooms/conservatories. As you can see in our gallery above, some of our examples are really porches that are screened in or glassed in. We decided to include these in this gallery because it’s an option for a similarly purposed room, which is a leisure area of the home that enjoys plenty of sun, yet is protected from the elements. What are sunrooms used for? Most often they’re a living room where you sit containing sofas, chaise lounges, chairs, rocking chairs, etc. As you can see, some sunrooms have a solid ceiling while others have transparent ceilings. Both work. Some are a hybrid with large skylights. The key is that 3 sides are a bank of windows (at least that was our requirement to include it in this gallery). Some ceilings are flat while others are vaulted or a cathedral shape. Common floors for sunrooms is tile; however, hardwood and carpet are solid flooring options too. If you’ll be entering the sunroom from outside frequently, tile is probably best because it’s the best type of floor to deal with water and mud. The obvious difference is that sunrooms have no open walls while covered patios just have a roof of some sort. This means sunrooms are easy to climate control, but the downside is you don’t get the “outdoor” feeling while sitting in sunrooms. Another downside to sunrooms is they cost more because of the finished flooring and expansive windows. The best solution is to have both a sunroom and patio (or deck). What type do I prefer? I much prefer the type with a solid ceiling and 3 walls with a bank of windows. I find a glass ceiling is simply too bright. I also really like the look of the room extension that’s wrapped in windows. It’s a great look. Sunrooms, also known as conservatories, are extensions of living rooms that are usually fully enclosed in glass on three sides. Unlike a conservatory, sunrooms have a true ceiling and roof instead of a glass one. However, sunrooms can have transparent roofs as well. In the United States, sunrooms are used for reading, relaxing or entertaining without having to be outside to enjoy the elements. This guide will show you the features and options of a sunroom and give you design ideas and inspiration for your very own sunroom. Sunrooms are mainly designed for relaxing and hanging out. Some people use them as breakfast nooks or dining rooms or even a space for a home office. The size of your sunroom will determine what you can actually do with space and what features and options it will contain. When talking about the size of a sunroom, the square footage of the area will be the sole factor considered in its designation. Small sunrooms are generally anything up to 200 square feet. While the actual size designation is irrelevant, what you can do with such limited space is not. Small sunrooms are more often used as sitting rooms for relaxation or reading. The will have a small end table and a chair or recliner and some form of overhead light or lamp. Other than that, they are fairly simple and used just to watch the world outside. Medium sized sunrooms offer more space for a variety of uses. In general medium size, it referred to as a sunroom with more than 200 square feet and less than 500 square feet. Medium rooms are more likely to be used as an extension of a living room rather than just a room on its own. You can also use this space as a dining room or a breakfast nook. It is a relaxing way to start your morning or end your day. Large sunrooms are defined as any space larger than 500 square feet. Large sunrooms will have a variety of uses for sitting and relaxing to entertaining. Most large sunrooms get converted to home offices. If this is the case you will need to make sure the electrician knows of your plans prior to installation, so the outlets and wires do not interfere with the large window panes. Window dressings are usually added when the room is more than a relaxation place, or when expensive equipment is stored within. Sunrooms, just like any other room in your home, will need items to make it usable. Furniture and shelving, for example. Once you decide if your sunroom is used as an office, for relaxation, or for entertainment, you will have a better idea of what you need inside. No sunroom would be complete without a spot to sit down. Either at a dinner table or in a cozy recliner to watch the world pass you by, chairs are almost a requirement. Sofas are popular in sunrooms because they offer seating for more than just one, or for one to stretch out and really relax. If you are going to use the space for a home office or for dining, you will also need a table. You can use a mission style desk as a conversion and have both! If you have a medium or larger sized sunroom, you should be tempted to place a sofa in there. You can also use a lounger or a fainting couch for more aesthetic appeal, depending on the style choices you make. Sofas can even be convertible sofas for laying out under the stars while still being indoors. You would need large skylights or a transparent roof in your sunroom for this, but if you do, consider offering options for laying down. As a home office, your sunroom will need a desk. You should ensure that it has enough room for your computer and equipment as well as phone lines, internet and cable runs. If you are planning for the sunroom to be used as a home office, you will need to pay extra attention to your budget for the storage and security. Regular glass windows will offer little security against break-ins for a quick smash-and-grab of your belongings. Most sunrooms are meant for relaxation and reading. You will need a bookshelf or two as well as a place to store accents and decorations. Because the room is comprised mainly of glass, it is difficult to mount shelving. However, freestanding options work just as well and can be part of the design or style choices. While most of the lighting in the sunroom will come from the sun, natural light has its drawbacks. It won’t last forever, for example, and on cloudy days, rainy days or other bad weather, it won’t be there at all. You will need to provide lighting to the room just as you would any other room in your home. Ceiling lighting is popular in the form of crystal chandeliers that can catch the rays of the sun or ceiling fans to help move warm air around to prevent the room from growing stuffy. If you have a solid ceiling, these options are easy to install. However, you will need to plan for brackets or even professional installation if you have a glass or transparent ceiling. Skylights offer the convenience of a transparent ceiling without the hassle of installing one. You can place skylights in various positions and in various sizes to capture the optimal amount of sunlight throughout the day. Skylights are also less expensive to install than a transparent ceiling and will still offer you enough of a real ceiling to mount overhead lighting or ceiling fans without special brackets or professional installation. Lamps offer a perfect balance between lighting and space saving. You can have floor lamps around the seating options and desk lamps for writing or studying on the desk or table. Because you can find a lamp in any design style, shape and size, decorating with lamps as accents in a sunroom are also popular and cost-efficient. Using energy saving bulbs and only utilizing the lights you need can also cut down on your energy bill. Flooring in a sunroom is just as important as the windows and ceiling, if not more so. You have a large assortment of flooring options to choose from, and all of them have their strengths and weaknesses. Hardwood flooring is very popular in sunrooms. It is easily installed and can accommodate the design and atmosphere of the room quite well. You also have choices of your choices as well. You can choose from a large assortment of wood options including Cherry, Oak, Maple and even Pine. One reason for the hardwood flooring popularity is that the cleaning and maintenance are pretty easy. Also, as long as you stay up on the sealant and protection applications (which should be done annually), they will also be resistant to sun fading. Another popular option is carpet. With so many piles, colors and materials to choose from you can have a carpet that is soft under your feet and matching any design style you choose. One drawback to the carpet in a sunroom is that it is susceptible to sun fading and you may need to replace it more frequently than other flooring materials. However, you can find carpets that are protected against sun fading either chemically or naturally, such as wool. Tile is a fairly popular option as well. It is relatively inexpensive for the materials and installation and can be done in any style. Tile is primarily used when the sunroom is used as a breakfast nook or dining room. Maintenance and clean up are a breeze and tile hold up to a lot of foot traffic. Tiles are also not going to be affected by direct sunlight as much as the other options. However, they can retain heat as well as cold and you may not always want to go barefoot on the tiles. Laminate is one of the least expensive flooring materials available and can be bought in virtually any style, color or pattern. Laminate is easy to maintain and will hold up to foot traffic fairly well. However, it is a weaker flooring material than the other options, and if you are constantly moving chairs around or re-positioning heavier items, it can tear and need replacing. When designing your sunroom, the style or theme that you choose should add to the ambiance and aesthetics of not only the room but of the home. At a bare minimum, it should complement or match the adjoining room. Country themes are popular in sunrooms because of their use of bright colors and exciting patterns. Checkerboard patterns in blues, red and greens add a great line to the room. Accenting country style sunrooms is just as fun and designing one. You can have natural wood furniture, flooring and lighting as well as marry bright, cheerful colors on the walls, braces, and accents. Contemporary styles, when used in sunrooms can really open the space. This style relies on soft colors for the primary design and bolder colors through the accents. By utilizing a contemporary design style, you can create a more relaxed and airy atmosphere. The furniture is also comfortable with softer textures and linens. Most contemporary flooring is bare floors (usually hardwood or laminate) which allow you to use more natural furniture pieces. Lighter wood furniture such as pine and maple are often seen in contemporary themes. Tropical styles and themes are trendy in sunrooms because they allow you to have a bit of fun with your design options. With the whole point of a sunroom to be inviting and relaxing, you can bring a bit of the tropics indoors. Bamboo and wood are the primary design features which can be carried out through tables, desks, flooring and even ceiling fans. For the furniture, you would tend to stick with wicker and rattan with a lot of large and soft pillows and blankets. The colors are also fairly muted with natural wood colors being dominant. White, pastels and light blues and greens are often seen in tropical themes. Farmhouse styles are also quite popular in modern sunrooms. Farmhouse design features are simple, soft and elegant. The style makes use of a lot of glass, such as shelving, coffee tables, and cabinet doors. When flooring is involved in the theme, Farmhouse tends to utilize hardwood planks in some of the softer wood tones like pine. Accents can use wire, open beam and canvas textures to draw the room together. When building and designing a sunroom for your home one of the most important first steps is to decide how big space will be as well as the primary usage. If you plan to have a nice relaxing room to read or nap, then your style and features should reflect that. Couches instead of chairs, shelving instead of tables and fewer window dressings or obstructions. You also need to consider what room the sunroom with be adjacent too. If you plan to have it near the kitchen, making the sunroom an alternative dining room would mean that you need more tables and chairs and less actual storage or shelving than if it was off of the living room where it would need bookshelves and recliners. Whatever you decide, your sunroom should be a room you enjoy being in as well as having as a part of your home. You can view our galleries to get more inspiration and ideas or use the tools to help you plan and design the sunroom you have always wanted.